Cold nights have set in hard this October. So far it's the second coldest on record. Add to that, the rains that were scarce during the growing season have been putting in more regular appearances, making harvesting messy, at the very least. 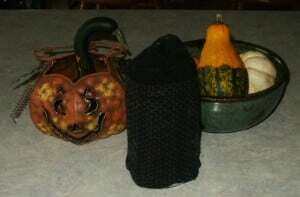 In spite of the weather, we've been working on cleaning up the garden and bringing in the fall harvest. Some of our family favorites that were still going strong at frost time were the Fall Red and Fall Gold raspberries. I really like these everybearing varieties because they start producing in late June/early July and keep going until frost. I put down soaker hoses in the patches back in July after it became obvious that we were going to be short on rain this season, and that saved the crop. Over the course of the season, we gathered quite a few quarts of berries. Several of them went directly into tummies, into pie, and into the jam pot, but most went into the freezer. Raspberries are very tasty, but they also pack a lot of nutritional punch. Ellagic acid, as well as all the other antioxidants found in raspberries, are useful to prevent damage to cell membranes and DNA, since they prevent the action of free radicals by quenching their oxidant potential. Other important phynutrients contained in raspberries are flavonoids: the most represented are quercetin, kaempferol and two cyanidin-containing molecules, cyanidin-3-glucosylrutinoside and cyanidin-3-rutinoside. These two latter molecules belong to the family of anthocyanins, important pigments that are responsible for the color of raspberries and other berries. Anthocyanins are not only pigments though, they also possess important antioxidant properties, and research has proven that they also work as antimicrobic agent both against bacteria and fungi. Further research is being conducted, and preliminary results show that raspberries probably have cancer-protecting properties: berries appear to inhibit cancerous cell proliferation in animals diagnosed with cancer, that have been eating a diet rich in raspberries for at least 3 weeks. According to research conducted in Netherlands, subsequently published in the journal Biofactors, the antioxidant content in raspberries is particularly high, clocking in at 50% higher than strawberries (a formidable antioxidant powerhouse themselves), up to three times higher than kiwifruit, and ten times higher than lycopene-rich tomatoes. Their high content in antioxidants is probably due to the presence of ellagitannins: these compounds are particularly exclusive to the raspberry, and have been reported to have important anti-cancer activity. By exclusion, ellagitannins may provide up to 65% of the total antioxidant capacity of raspberries, with another 20% provided by Vitamin C (ascorbic acid), which is contained in quantities of 30mg per 100g. The remaining 25% consists of anthocyanins (in particular pelagonidin glycosides and cyanidin). Research has also observed that correctly frozen raspberries do not lose significant quantities of these important antioxidants (but processed raspberries do, so you should always prefer fresh berries to processed foods). The only exception appears to be vitamin C, which is approximately halved by the freezing process. If you correctly follow our freezing guidelines you'll add vitamin C in the form of lemon juice, which is a common trick to both preserve their antioxidant content and keep a bright color. While discovering all these new and peculiar phytonutrients is cool, we shouldn't forget about traditional nutrients, especially vitamins. Raspberries are an excellent source of vitamin C, manganese, folate, riboflavin, magnesium, niacin, potassium and copper. This makes them a very good source of B class vitamins, as well as an excellent source of soluble dietary fiber. A study published in the Cancer Letters showed that diets high in fruits (in particular, raspberries, blackberries and muscadine grapes) reduce the risk of developing cancer by inhibiting metalloprotease enzymes: these enzymes are normally present in moderate quantities, and are needed by our bodies to successfully develop tissues. If they're produced in excessive quantities they are an important cause of cancer development, since they aid cancerous cells in invading other tissues. A study published in the Archives of Ophtalmology involving 110,000 subjects of both sexes evaluated the effects of consuming fruits, vegetables, antioxidant vitamins such as A,C and E and carotenoids on the risk of developing Age-Related Macular Degeneration. Macular Degeneration is the primary cause of sight loss in adults, and the study found that by eating at least 1.5 servings of fruits daily, one can reduce the risk of developing the disease by 36%. Risk reduction was not directly linked to consumption of vegetables, antioxidants and vitamins, but to the consumption of whole fruits: the optimal level, according to the study, is three servings a day, which can be easily reached by sprinkling raspberries on your morning cereal or dressing up salads with other fruits. 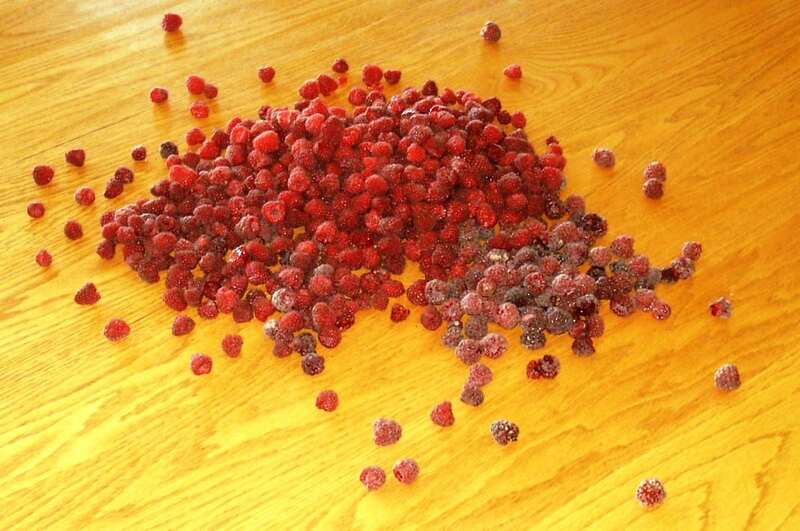 To freeze my raspberries, I first dump them out on the table to sort through them and pick out any questionable berries and foreign material. As I sort through them, I lay them out on cookie sheets lined with Super Parchment. BTW, if you've never used this stuff, it's amazing. You'll never have to grease your pans again and I've reused mine for years. I usually let these freeze on the cookie sheets overnight and then place them in vacuum seal bags the next day for long term storage. NOTE: I DON'T WASH THESE BERRIES. Washing makes them mushy, and my patch is usually well mulched and pretty clean. 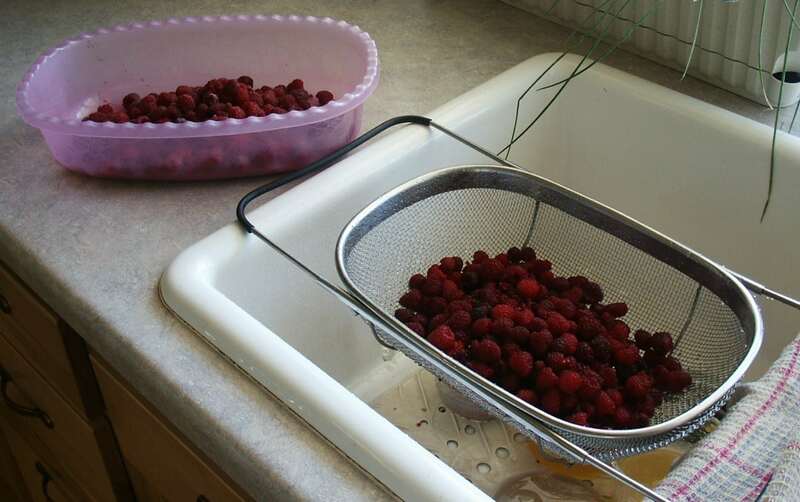 (Yes, I'm cheating the pictures and using different pickings, but they are all our raspberries.) The vacuum seal bags virtually eliminate freezer burn, which is a major problem with individually frozen fruits and veggies not protected by a sauce or syrup. I use these berries to flavor kombucha, to mix into yogurt and oatmeal, and in various other recipes. Backtracking to the jam pot, seedless raspberry jam is a probably my boys' (husband and sons) favorite fruit spread. 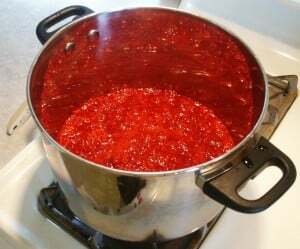 I'm a traditionalist, thus far, when it comes to my jams and jellies, using either the pectin the fruit itself or standard powdered pectin and full sugar amounts. In the future I will probably experiment with options that use less sugar, but as we use these spreads sparingly I am not overly concerned. The fruits destined for the jam pot do get a quick rinse in the sink. 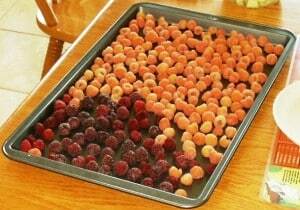 You never want to soak berries, as they will act like little sponges. Then into the pot they go. After they get nice and soft, we run them through the food strainer. This gets out most of the seeds and leaves more pulp than straining through a jelly bag, which I think gives the final product a better flavor. 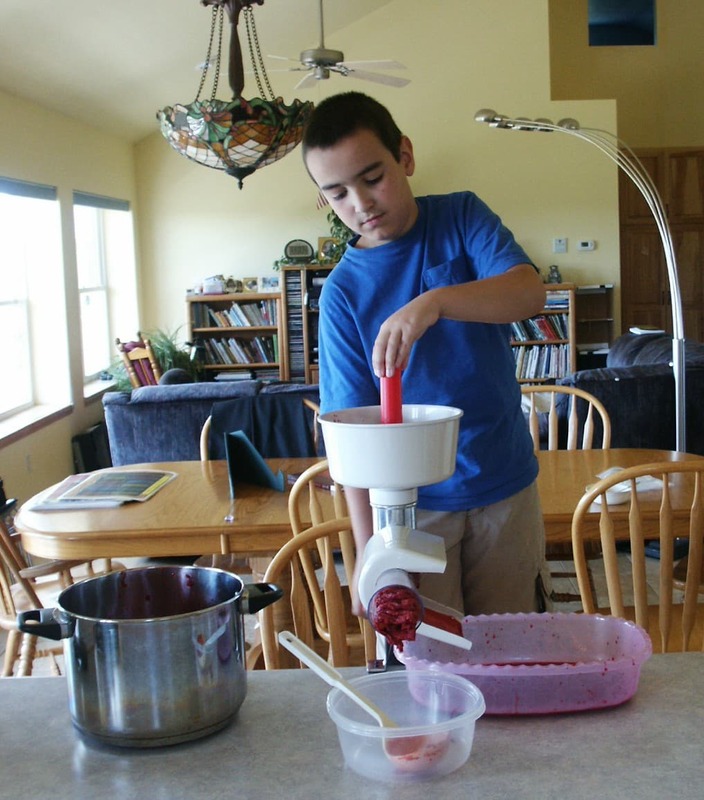 To make red raspberry jelly, I start with around five pints of berries, which yields around six cups of finished product. Prepare raspberries – clean, cook, juice. Prepare boiling water canner. Heat jars and lids in simmering water until ready for use. Do not boil. Set bands aside. Measure juice and other ingredients. If you need more juice, simply add water to fruit pulp and extract. Pour prepared juice into a 6-or 8-quart saucepan. Gradually stir in pectin. Add up to 1/2 tsp. butter or margarine to reduce foaming, if desired. Bring mixture to a full rolling boil that cannot be stirred down, over high heat, stirring constantly. Add entire measure of sugar, stirring to dissolve, Return mixture to a full rolling boil. Boil hard 1 minute, stirring constantly. Remove from heat. Skim foam if necessary. Ladle hot jelly into hot jars, leaving 1/4 inch headspace. Wipe rim. Center lid on jar. Apply band until fit is fingertip tight. Yields 6 cups of jelly. 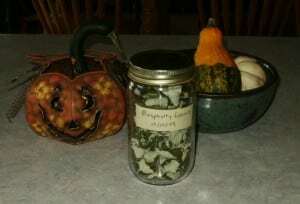 I tried something different this year – preserving fruit in alcohol. I figure if they can make cherry bounce by putting Door County cherries in brandy and put Clementines in vodka, why not put some raspberries in Amaretto? Raspberries and almonds are very yummy, after all. So here you see it, my one experimental bottle of raspberries in Amaretto, which have now been capped and stashed in the basement fridge along with the storage apples. I think this might be quite tasty over ice cream, or just on its own. 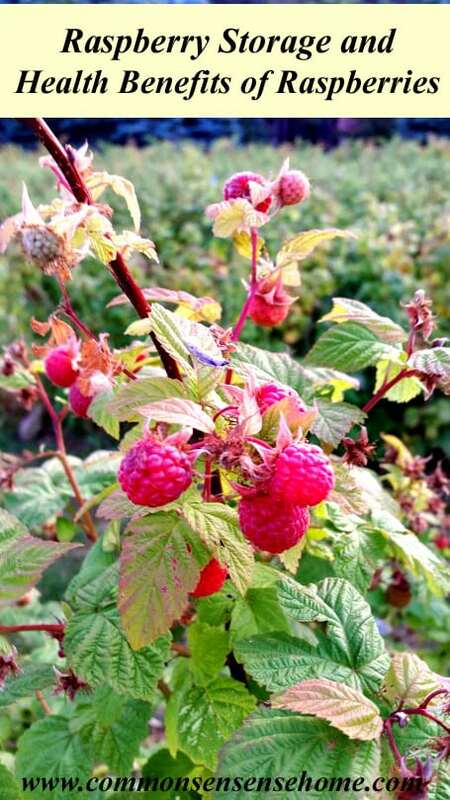 Red raspberry leaves have been used for many years dating back to the ancient Greeks and Romans. Some of the illness they used red raspberry leaves to treat included the flu, gum disease, rubella, upset stomach, hangovers, diarrhea, fevers, vomiting, menstrual problems, and inflammation. Red raspberry leaves have also been used for a mouth rinse to treat sore throats and irritations of the mouth. The most popular use of red raspberry leaves would be for pregnancy .It has been known to help with nausea associated with pregnancy and to ease the pains of delivery. For woman that are not pregnant and have menstrual issues red raspberry leaves are known to regulate the menstrual cycle and relive the symptoms of PMS. Red raspberry leaves can also be used on the skin as an astringent. It’s good for people suffering from acne and can improve skin firmness. Red raspberry leaves have also been found to lower blood sugars in people with diabetes. Beware though if taken in large does the red raspberry leaves could cause the blood sugar to drop to low. There have been few side effects reported when taking red raspberry leaves. After I harvested the berries, I also gathered leaves from some young plants that had stayed outside the patch to load into the dehydrator to use later for tea. These were dried and packaged in a glass jar, then labeled with date and contents (who knows what they will look like in a year). BTW, when I stash my herbs in the walk-in pantry, which usually has the door left open because we are in and out so much, I started covering them with little “cozies” made out of my husband's old mismatched socks to keep out the light. If I was really crafty I'd embroider labels on them, but for now I just have to pull off the sock and take a look at what's under it. Still, it's crude but it works. Light is the enemy of dried herbs. So, if you're fortunate enough to have access to fresh raspberries, make sure to take advantage of them. If not, frozen raspberries still contain most of the nutrient value and raspberry leaf tea is available in many venues. I love it when the foods I enjoy the most turn out to be good for me (and my family) too. Oh, and just in case you're short on berry recipes, the North American Bramble Grower's Association has a great list of recipes, including Beverages, Breads, Muffins and Pancakes, Cakes, Deserts with Cooked Fruit, Desserts with Uncooked Fruit, Frozen Desserts, Jams, Jellies, Preserves, Pies and Cobblers, Salads, Sauces, Vinegars, and Dips and Others (savory recipes and snack foods) . Funny you should mention grandmas…one of the only things I remember about my mom's mom, who passed away when I was around 2 1/2 years old, was her golden raspberries. I don't know if she had the same variety that I do, but I think it's possible, because my mom has the same variety. I absolutely love the Super Parchment. I just purchased another sheet and cut up one of my older sheets this week to make liners for my bread pans (the sheet had been damaged some years back by an overeager boy with scissors). Now my quick breads come out much easier. Great info – it’s appreciated so much. Your description & out lay of of how to prepare the jam – puts the smell right here. Will be using your ideas & methods. Thx. For your dedicated time in describing procedures very clearly. Thank you, Rose, glad you like it. How bout recipes for “Freezer jams” ? My freezer is usually filled with produce, so I don’t personally make freezer jams, but you could certainly freeze any of the low sugar recipes instead of canning. Oh here’s something I remember , My mother would make jams and use wax to seal the jam . Is that a good idea ? My mom used to do the same thing, but it’s no longer recommended. The understanding of canning science has improved a little over the years. The preferred processing method now is 10 minutes in a boiling water bath for jams and jellies in pints, half pints or 1/2 cups. This processing time is enough to drive all oxygen out of the headspace (area between the top of the jam and the top of the jar). When the jar is removed from the canner, the lid pulls down because of that natural vacuum, creating a no-oxygen environment inside that jar. No oxygen = no action from decay critters that need oxygen to function. 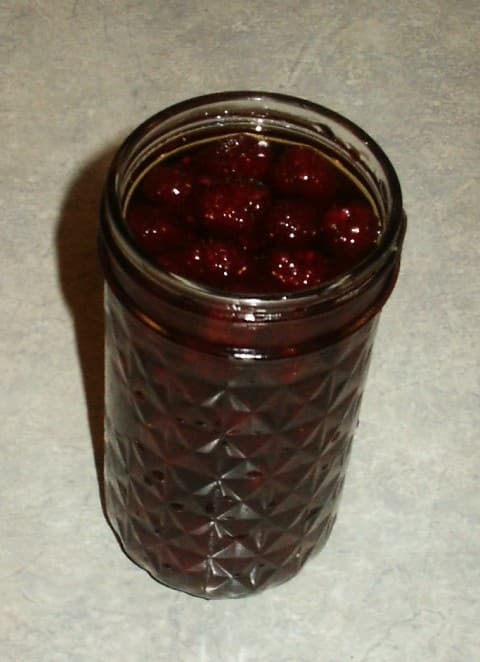 The sugar in the jam/jelly ties up free water, which is another thing that most bacteria need, and the lower pH of most fruit further inhibits bacterial growth.